Cracked and broken pieces of cast iron generally call for replacement, with the exception of unique or iconic parts. In those cases, some clients may prefer to pay more to have the pieces repaired. Mechanical repairs are effective in areas that the cast iron is thick enough to be cut, tapped and bolted but won’t work for thinned pieces. Restorers in the UK employ a technique called cold stitching which calls for drilling a series of holes to create a mechanical join. Architectural cast iron can rarely, if ever, be completely disassembled for restoration. There are multiple facets to the level of disassembly: client’s budget, occupancy of building, type of fastening system, and status of interior finishes. The more that a piece can be disassembled, the better condition it can be kept in. Also, restorers need to keep in mind that disassembly is an ongoing process that will have to be done throughout the life of the piece. The goal is to make each disassembly count and lengthen the time between each as much as possible. Standard air abrasive cleaning has been the go-to for removing rust from cast iron. While this method works well, there are some questions for each specific project that need to be considered. What are the other options if standard air abrasion is not possible? Is there an issue with removing antique or historic finishes while removing the rust? How can you be sure that you do not have to repeat your restoration project every 25 years due to rust? The steel can be removed and treated with hot dip galvanizing. Cast iron should not be hot-dipped but can be sprayed with a zinc or zinc-aluminum thermal spray to metalize it. The finishing process must be done largely in an enclosed workshop. In the process of disassembly, you must locate and unfix fasteners which may be hidden inside the castings. This can be an issue if the building is currently in use. In addition, replacing rusted wrought iron or steel fasteners with stainless steel coated fasteners is essential to prevent damage from rust. However, you need to be prepared for the expense of making customized stainless steel coated fasteners. Cast iron structures were not built to be waterproof. Many employ overlapping tiles in some areas to be water resistant but definitely not all. This can cause a real issue when the cast iron cladding covers an occupied area. A sealant plan for a cast iron project adjacent to an occupied area is not one size fits all. You should consider several different approaches like using membranes or designated containers to catch the water that inevitably will leak through. There are two main design issues in older architectural cast iron: Poor tensile strength (especially where heavy loads are on cladding pieces in or out of the plane of the facade), and concrete poured behind base assemblies to carry heavy loads from above. To fix the first issue of tensile strength, modern architects use new structural steel as a support and hang the cladding on it. To fix the second issue, you need to remove the concrete which causes temperature differences and cracking and reinforce with structural steel as well. With so many small parts present in architectural cast iron, construction documentation is essential for assembly and upkeep. Assembly instructions need to be clear without extraneous details. Also, documentation needs to be practical and not theoretical. For example, pieces that are identical in theory are usually not interchangeable due to filing and wear. Consider how close the restoration site is to a sufficient foundry. Many projects, especially large ones, have required a good deal of the assembling, disassembling and cleaning and repair to be done at different sites. Coordinating the transportation and overall logistics of your project should not be overlooked. 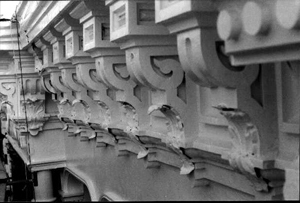 At Antique Cast Iron, we are experienced in handling all types of cast iron restoration projects. We are located in Cherry Valley, N. Y. and have been in business since 1987. 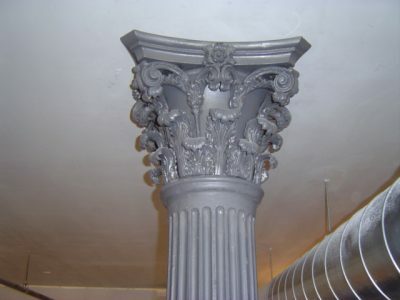 Antique Cast Iron has restored a number of building projects in New York City and we are passionate about historic restoration and preservation. We would love to help you as you endeavor on your project, no matter the size or your experience level. Please contact us if you have a question or need an estimate on your project. Copyright © 1987 - 2019 Antique Cast Iron, LLC.